Three types of documents have been found in the caves near Qumran: copies of books of the Hebrew Bible, e.g., Isaiah, of which two almost complete scrolls have been found; copies of books now collected in the Old Testament Apocrypha and Pseudepigrapha, e.g., Tobit, 1 Enoch, and Jubilees; and documents composed by an ascetic community, e.g., a book of community rules called The Manual of Discipline, an allegorical account of the community called The War of the Sons of Light with the Sons of Darkness, a group of devotional poems called The Thanksgiving Psalms, a commentary on the Book of Habakkuk, and an extensive work, known as the Temple Scroll, containing ritual law. , ancient village on the northwest shore of the Dead Sea, in what is now the Israeli-occupied West Bank. It is famous for its caves, in some of which the Dead Sea Scrolls were found. Archaeological work at Qumran has yielded a profile of its history. ..... Click the link for more information. , and thus survived the destruction of the settlement in c.A.D. 68. Startling parallels in expression and thought between the Qumran materials and the New Testament have led to speculation as to their influence on early Christianity. The Temple Scroll, for instance, revealed a list of rules of conduct resembling standard Christian ethics. Some scholars have tried to establish that Jesus and John the Baptist were influenced by, or members of, a Qumran Essene community, but such interpretations are widely disputed. More recent work by other archaeologists and biblical scholars has questioned the association of the scrolls with the Qumran ruins and the Essenes. [Heb.,=son of the star], d. A.D. 135, Hebrew hero and leader of a major revolt against Rome under Hadrian (132–135). He may have claimed to be a Messiah; the Talmud relates that Akiba ben Joseph credited him with this title. [Heb.,=fragrant, or city of the moon god], Arab. Ariha, town (2003 est. pop. 19,000), West Bank, in the Jordan valley N of the Dead Sea; nearby is the site of the ancient city of Jericho. ..... Click the link for more information. , were left by Samarians massacred by Alexander the Great in 331 B.C. Most of the originals of the scrolls are at the Rockefeller Museum in East Jerusalem; the rest are at the Israel Museum's Shrine of the Book in Jerusalem. The intact scrolls and other materials were published in the decades following their discovery, but many fragments remained unpublished and under the control of a small group of scholars, originally appointed by Jordanian officials, and their intellectual heirs. As a result of the 1967 Arab-Israeli War, control of all the scrolls passed to the Israeli Antiquities Authority. International dissatisfaction with the limited access allowed to, and the slow rate of publication of, the scrolls that remained unpublished led the Huntington Library in San Marino, Calif., to allow (1991) scholars access to its set of master negatives of the scrolls despite the objections of the Israeli Antiquities Authority. Subsequently the authority removed its restrictions on the use of the unpublished scrolls, and expedited the publication of them. See texts published in the series Discoveries in the Judaean Desert (39 vol., 1955–2002); T. H. Gaster, The Dead Sea Scriptures (1976); M. A. Knibb, The Qumran Community (1987); L. H. Schiffman, The Eschatological Community of the Dead Sea Scrolls (1989); J. A. Fitzmyer, The Dead Sea Scrolls (rev. ed. 1990); H. Shanks et al., The Dead Sea Scrolls after 40 Years (1991); H. Shanks, ed., Understanding the Dead Sea Scrolls (1992); L. H. Schiffman, Reclaiming the Dead Sea Scrolls (1994); N. A. Silberman, The Hidden Scrolls (1994); N. Golb, Who Wrote the Dead Sea Scrolls (1995); H. Shanks, The Mystery and Meaning of the Dead Sea Scrolls (1998); G. Vermes, The Complete Dead Sea Scrolls in English (rev. ed. 2004); J. J. Collins, The Dead Sea Scrolls (2012). A section of the Psalms scroll, a liturgical collection of psalms and hymns and one of the Dead Sea Scrolls, believed to include the oldest surviving copies of the books of the Old Testament. AP/Wide World Photos. In 1947, a young Bedouin shepherd was searching the hills around the Dead Sea, looking for lost sheep. Finding a small crevice opening downward, he dropped a pebble to see how deep the cave might be. Instead of the expected "thunk," he heard the sound of broken pottery. What he had found shook the world. Sealed up in the cave, stored in jars and clay pots, were scrolls hidden away ever since 70 CE, when Titus and his Roman Legions destroyed the Jerusalem Temple. The Qumran community was the home of the Essene brotherhood, a band of devoted right-wing Jews who lived during the time of Jesus. Archaeology has since discovered they had built a thriving school and a place of meditation and ritual. Perhaps even John the Baptist was one of their shining stars. They were patriots of the highest order, waiting for the coming of the Messiah who would drive out the Romans and restore the kingdom to Israel. When Titus arrived with his army, the Essenes hid their library, probably intending to return after the Roman threat was eliminated. But they never came back. For almost two thousand years the tablets and parchments that had instructed and informed their beliefs lay hidden in the ground until their discovery electrified scholars all over the world. What was it that caused the excitement? Did the Dead Sea Scrolls offer new insights into Jewish belief? Were they proof that the Bible we now have is somehow wrong? Has Christianity been based on a lie? Did they contain shocking new revelations that would destroy the belief system of the Western world? Was there a cover-up conspiracy at work? In a word, no. True, the scholars didn't help the situation much by immediately spiriting the scrolls away to secret locations and keeping the results of their academic studies quiet. But that situation had nothing to do with a cover-up. First of all, some of the parchments were, understandably, very fragile. It takes a lot of time and painstaking work to open them without immediately crumbling them. Second, the constant problem of possession had to be addressed. The scrolls don't belong to the public. In a perfect world, the best experts could simply drop what they are doing and get to work. But, needless to say, this is not a perfect world. Third, the academic community works under the "publish or perish" principle. Scholars, understandably, wanted an "exclusive." They wanted to keep their work quiet until they could write the definitive book and defend it before the academic court of inquiry. Time has laid most of these theories to rest. But that in no way lessens the importance of the Dead Sea Scrolls. They are, without a doubt, the archaeological find of the twentieth century. To understand why, it is helpful to delve into the field of biblical translation. Some fragments of the Hebrew Bible, that which Christians call the Old Testament, were probably written as early as a few thousand years BCE. But the majority of the canon wasn't written down until much later (see Bible). And until the twentieth century, the oldest complete copy of the Bible dated only to the ninth century CE. What existed before this time were copies of copies of copies. Granted, the process of hand copying was extremely regulated by scholars. Every word was counted and every page read by many people. Still, if a small mistake had been made once and then copied over and over, each time allowing for the possibility of further mistakes, a tenthor even hundredth-generation copy could have been quite different from the original. So the question remained: How accurate, after all these years, was the Bible? With the discovery of the Dead Sea Scrolls, scholars now had copies going back to before the time of Christ. The complete book of Isaiah was there, along with fragments from every single book except the book of Esther. Their importance lay in comparing them to modern translations. How close were they? The answer is, very close indeed. The copyists down through the centuries had done their work amazingly well. So far, at least, there have been only very minor mistakes or differences discovered. The Dead Sea Scrolls have convinced scholars that modern Bibles are very faithful to the originals. Of course, the scrolls discovered at Qumran were not original either. They, too, are copies of copies. But their importance lies in the fact that they are so much closer in time to the originals. Not nearly as much time had passed to allow significant changes to have cropped up. This is not nearly as exciting to most people as conspiracy theories and new religious philosophies. But to Bible scholars, it is the stuff of grand adventure. The Qumran Caves, where the famous Dead Sea Scrolls were discovered. Discovery of additional “lost” scrolls promises more controversy as texts reveal hints of biblical treasures and direct interaction with angels and gods. Information gained from the Dead Sea Scrolls, which were discovered near Qumran, Israel, in 1945 and are slowly being translated and released to the public, may have a revolutionary effect on both the Jewish and the Christian religions. These scrolls, believed by many scholars to have been written by a sect known as the Essenes, refer often to a great Teacher of Righteousness and a great warfare between the Sons of Light and the Sons of Darkness. The sect forms a definite link between Judaism and Christianity, and many scholars have suggested that Jesus was a member of the Qumran group. Shanks and other scholars have pointed out that the concepts of what would come to be known as Christian doctrines are to be found in Jewish mystical trends that were in circulation decades before the birth of Jesus. Among the subjects thought to be unique to Jesus and to Christianity that are found in the scrolls are the beatitudes of the Sermon on the Mount, the idea of the Messiah, and the apocalyptic prophecy of a final battle between the forces of good and the forces of evil. Shanks finds evidence in the Dead Sea Scrolls that there were several factions of Judaism at the time when Christianity was being formulated. One of these schools of Jewish theology taught a far more apocalyptic doctrine than many Jewish scholars have wished to believe. Eschatology—the study of the so-called endtimes—has usually been associated with the teachings of early Christianity and the beliefs of modern-day evangelical Christians. After the Roman destruction of Jerusalem and Judea in 70 C.E., Shanks says, only two of the many splinter groups survived—Christianity and Rabbinic Judaism, which dropped its apocalyptic remnants and evolved into the major Jewish doctrines that exist to this day. Shanks’s book contains a chapter on the Copper Scroll, which was discovered in March 1952 by a team of Jordanian and French archaeologists. The ancient, engraved copper sheet had been broken into two parts and hidden in a cave in Qumran, and the contents translated thus far have puzzled scholars by seeming to provide hints about the location of buried biblical treasure. The examining scientists found the scroll too fragile to unroll, so they sliced it into twenty-three segments. The scroll was not quite a foot wide and about eight feet long. Scholars concluded that the text, engraved down twelve columns and listing sixty-four caches of treasure from gold bars to silver ingots, was in Hebrew, but they were baffled by the figures of twenty-five tons of gold and sixty-five tons of silver, which would have totaled more than the entire amount of those precious metals mined worldwide at the time of the engraving. In March 2002 Ronald Feather, a metallurgist and a member of both the Jewish Historical Society and the Egypt Exploration Society, argued that the copper document had not been written by a member of the Essene monastic sect. Feather believes the engraved scroll, which lists the proverbial treasures of Solomon buried in the Holy Land, is written in Egyptian, not in Hebrew. In Feather’s carefully derived opinion, the scroll can be traced back to the monotheistic court of the Egyptian pharaoh Akhenaten and Queen Nefertiti in Amarna, six hundred miles south of the Dead Sea and halfway down the Nile between Cairo and Luxor. 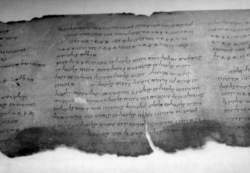 In October 1999 another “lost” Dead Sea Scroll was unearthed that has the possibility of setting off another theological firestorm. If the Angel Scroll, as it is known, proves to be authentic, Jews and Christians will be presented with a new understanding of how the ancient Israelites viewed God, the angels, and humanity’s place in the universe. According to researcher Barry Chamish, the Angel Scroll is one thousand lines long and had been purchased in Jordan by Benedictine monks and taken to their German monastery in 1970. In 1977 one of the group, Father Gustav Mateus, died and bequeathed his photographs and transcriptions of the scroll to an unnamed Jerusalem college administrator who, in turn, handed the material over to Stephan Phann, a member of the team of scholars translating the scrolls held by the Israeli government. Subsequently, Phann’s findings were published in the news magazine Jerusalem Report. In presenting the information, Phann admitted that some scholars were skeptical, but he said that most experts were in agreement that the text of the Angel Scroll “felt” genuine. The bits of the scroll that were released for the public’s examination deal with “divine chariot-throne themes with elaborate details of angels ascending heaven’s multiple gates.” Such references may be of great interest to those who take a literal view of the biblical accounts reporting encounters with extraterrestrials/angels. Mordechai Spasser, an Israeli UFOlogist who is also a student of Kabbalah, cautioned researchers about taking the UFO viewpoint without more study. Spasser stated that from what he had read, the scrolls appear to refer to the “astral plane” and other aspects of Jewish mysticism. According to the plan of that day, the Voice went forth to me and directed me and he drove me by the Spirit. And a vision was revealed to me from the Most High, and [the] Prince of Angels lifted me up in the Spirit and I ascended heavenward above the high places of the clouds and he showed me the great world and the image of the gods. And I pondered the appearance round about and there was no time and no place and their appearance from the dwelling places of light was like a rainbow in the clouds. And they had no bodies and no bodily structure and the dominion of darkness was over all of the earth round about. It seems very apparent that the Dead Sea Scrolls have only begun to yield sources of inspiration and controversy, to believers and nonbelievers alike. manuscripts written in ancient Hebrew, Aramaic, Nabataean, Greek, Latin, Palestinian-Syriac, and Arabic, discovered in 1947 and later years in caves on the western shore of the Dead Sea. They are written mostly on parchment or papyrus, but also on potsherds, copper, and wood. The manuscripts discovered at the various sites vary according to content and date of writing. 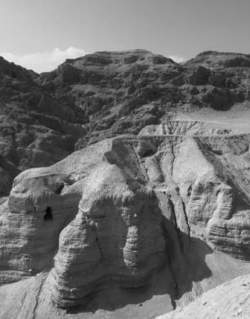 Qumran manuscripts (from the Wadi Qumran area).. About 40,000 fragments of manuscripts were found in 11 caves in the vicinity of the Wadi Qumran, representing the remains of about 600 works—Biblical books, apocrypha, and the writings of the community that has become known as the Qumran community. According to paleographic and archaeological evidence, most of the Qumran manuscripts were written between the second century B.C. and A.D. 68. Most of the scrolls have not yet been published. The numerous fragments of Old Testament books and apocrypha represent different versions of the protocanonical text of the Old Testament and add a new dimension to the study of the Old Testament text and to Biblical criticism. The most important works of the Qumran community are the Manual of Discipline, containing the rules of the community, the Damascus Document, the War Scroll, the Thanksgiving Psalms, commentaries on Biblical books, and anthologies of messianic and eschatological texts. They reflect the ideology, social views, and organizational principles of a sect opposed to official Judaism that lived in the Judaean Desert from the late second century B.C. until A.D. 68. Near the caves the remains of three Qumran settlements have been excavated, including the ruins of the community’s central complex, the Khirbet Qumran, destroyed by the Romans in A.D. 68. The complex includes an aqueduct and cisterns, various workshops, a kitchen, storerooms, storage bins for grain, a refectory, and a scriptorium. A cemetery adjoins the central complex. The manuscripts and archaeological evidence show that the members of the Qumran community adhered to principles of communal ownership of property, obligatory collective labor, and communal dining. The founder and spiritual leader of the Qumran commune was the anonymous Righteous Master to whom, it was believed, god had revealed secrets unknown even to the prophets. The Qumran community was very likely a part of the Essene movement. The sect’s dualistic and messianic-eschatological views and its social and organizational principles influenced the early Christian communities that were forming in the first century A.D.
Masada. The stronghold of Masada on the southwestern shore of the Dead Sea, with its sumptuous palaces and large storerooms, had been built in the reign of Herod I in the first century B.C. and was seized in A.D. 66 by the Zealots, an extremist anti-Roman group. It became the last stronghold of the insurgents in the Judaean War of 66–73 and was destroyed by the Romans in 73. Excavations at Masada between 1963 and 1965 led to the discovery of manuscripts in ancient Hebrew, Aramaic (including 759 household records on potsherds), Greek, and Latin. The manuscripts found at Masada are also important for dating the Qumran manuscripts. The Masada archive has not yet been published, with the exception of an apocryphal work by Ben Sira. Judaean Desert caves. Excavations conducted in 1952 and in 1960–61 in caves at Wadi Murabbaat, Nahal Hever, Nahal Mishmar, and other places where the remnants of Bar Kokhba’s rebel army were in hiding unearthed, in addition to fragments of Biblical texts (essentially coinciding with the Masoretic text), archives of commercial, household, and legal documents in ancient Hebrew, Aramaic, Nabataean, and Greek that shed light on the socioeconomic structure of Judaea and Nabataea in the period between the Judaean War of 66–73 and the Bar Kokhba Revolt in 132–135. Also found were the first authentic documents pertaining to the Bar Kokhba Revolt, including some issued by the rebel leader himself. Only the archives of the caves of Wadi Murabbaat (DJD II) have been published so far. Khirbet Mird. Excavations at Khirbet Mird, southwest of Wadi Qumran in the Kedron Valley, conducted in 1952–53, brought to light manuscripts written chiefly in Palestinian-Syriac and Greek, but also including some in Arabic dating from the early Byzantine and Arab periods (fourth to eighth centuries). Finds here included fragments of New Testament and apocryphal writings, commercial documents, and a fragment of Euripides’ Andromache, dating from the sixth century A.D. The manuscripts from Qumran, Masada, Wadi Murabbaat, and other parts of the Judaean Desert partially fill the more than 300-year gap in the history of Hebrew writings (second century B.C. to second century A.D.) and give some idea of the social and ideological atmosphere in the Near East at the time of the rise and early development of Christianity. The specially created International Committee of Scholars is engaged in publishing the texts. A new branch of historical philology, Qumranistics, is concerned with the study of the Dead Sea scrolls. Burrows, M., J. Trever, and W. Brownlee. The Dead Sea Scrolls of St. Mark’s Monastery, vols. 1–2. New Haven, 1950–51. The Dead Sea Scrolls of the Hebrew University. Edited by E. L. Sukenik. Jerusalem, 1955. Discoveries in the Judaean Desert, vols. 1–5. Oxford, 1955–68. Yadin, Y. The Finds From the Bar Kokhba Period in the Cave of Letters. Jerusalem, 1963. Yadin, Y. The Ben Sira Scroll From Masada. Jerusalem, 1965. Yadin, Y. Masada. London, 1967. Yadin, Y. Bar-Kokhba. Jerusalem, 1971. Bar-Adon, P. The Cave of the Treasure: The Finds From the Caves in Nahal-Mishmar. Jerusalem, 1971. Bar-Adon, P. “An Additional Qumran Settlement.” Eretz-Israel, vol. 10, 1971. Amusin, I. D. Rukopisi Mertvogo Moria. Moscow, 1960. Amusin, I. D. Nakhodki u Mertvogo moria. Moscow, 1965. Kovalev, S. I., and M. M. Kublanov. Nakhodki v ludeiskoi pustyne. Moscow, 1964. Livshitz, G. M. Proiskhozhdenie khristianstva v svete Rukopisei Mertvogo Moria. Minsk, 1967. Burchard, C. Bibliographie zu den Handschriften vom Toten Meer, vols. 1–2. Berlin, 1957–65. Revue de Qumran, vols. 1–8, nos. 1–30, 1958–73. La Sor, W.S. Bibliography of the Dead Sea Scrolls. 1948–1957. Pasadena, 1958. Jongeling, B. A Classified Bibliography of the Finds in the Desert of Judah, 1958–1969. Leiden, 1971.